going all the way! What should you do? Cabbage soup diet? Wait.. no, that’s from the 70’s. Well.. let’s just stop right here! Restrictive diets are a sure fire way to set yourself up to fail. 1. Restrictive diets that are too low in calories, and nutrients cause the body to hold on to body fat. When you starve your body, your body thinks it’s starving. That makes sense right? 2. Restrictive diets often lead to binge eating! Every day we wake up with the potential to be a little bigger or a little smaller. all week but consume so many calories on the weekends that we cannot get ahead. I can help you with your meal plan! Downloading generic diets are not the way either. You are an individual. Generic diets are not based on your dietary needs. You need a different meal plan than the girl in the cube next to you. This is what consistency , not perfection looks like. lifting. She has leaned out in just a few short weeks! She is coming in lean and tight. I’m very proud of her, because she is a pro at flexible dieting. 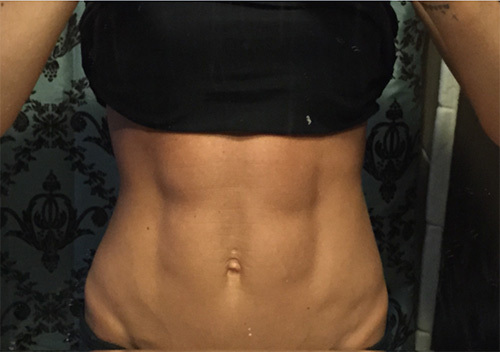 “I made it through Halloween and birthday dinners without completely negating my progress. Carbs, Fats, Protein and Fiber. This ensures you are eating for nutrition as well as physique goals. As your body changes, your macros can be tweaked to prevent stalls. Bottom line, you will eat more food because your fueling your body not starving. have to deprive yourself of things such as movie treats if that’s what you want. I don’t eat fats. Don’t want to eat fats. Coach gave me one egg yolk a day. Here’s some science for you. You need fat in your diet. Never go below 20% fats in your diet. Not even the most extreme cutting should be that low. Jax on a reverse diet to give her more food and slowly upped her carbs. carbs a day. She does NO cardio but lifts heavy weights. Abs: no starving here. Over 400g carbs a day. BAM! Look at this bikini body! Jax has abs now, because she eats. You aren’t locked into one menu. You can eat with your family. You can eat what they eat. You don’t have to skip social functions. You can have food that satisfies and fuels your progress. If you need a meal plan, please, let me help you! Start this year with the right plan for YOU.